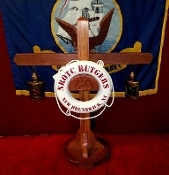 SOLID MAHOGANY KISBIE WITH PORT AND STARBOARD BRASS AND COPPER LANTERNS HANGING FROM BRASS DECORATIVE HOOKS ON CUSTOM LATERAL ARMS, A HAND CARVED SOLID MAHOGANY CROSSED ANCHOR LIFERING HOLDER, AND A PERSONALIZED 20” OR 30" WHITE LIFERING. PLEASE SELECT CHOICE OF WOOD, LIFERING SIZE AND LETTERING COLOR BELOW. FOR INTERNATIONAL SHIPPING, PLEASE CONTACT US BY PHONE AT 619-474-2002 OR 2003 OR BY EMAIL AT QUOTES@THEBOSNSLOCKER.COM TO REQUEST A RATE QUOTE.